Director – Peter Hewitt, Screenplay – Joel Cohen & Alex Sokolow, Based on the Comic Strip Created by Jim Davis, Producer – John Davis, Photography – Dean Cundey, Music – Christophe Beck & Tim Boland, Music Supervisor – Spring Aspers, Animation Supervisor – Chris Bailey, Animation – Rhythm and Hues Studio (Visual Effects Supervisor – Dan DeLeeuw), Visual Effects – Rainmaker (Supervisor – Jason Dowdeswell), Additional Visual Effects – The Orphanage Inc, Pixel Magic (Supervisor – Raymond McIntyre Jr) & SW Digital (Supervisor – Randall Rosa), Special Effects Supervisor – Alan E. Lorimer, Production Design – Alec Hammond. 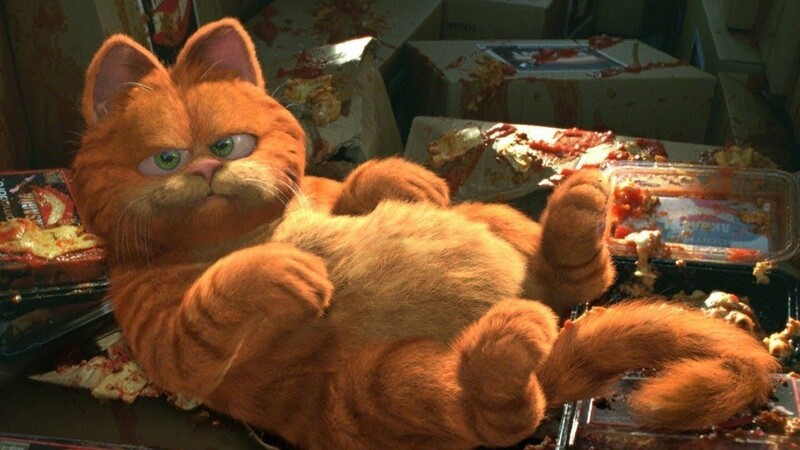 Production Company – Davis Entertainment Co.
Garfield is a fat, lazy cat who lives with his master Jon, outsmarts all the other animals of the neighbourhood and can never be bothered to do anything. Jon has a crush on vet Liz Wilson and contrives to keep finding excuses to take Garfield in for checkups. Liz presents Jon with Odie, a dog in need of a home. Garfield is disdainful of Odie’s stupidity and resents him stealing Jon’s attention. He locks Odie out of doors one night, only for Odie to wander away. Odie is found by a lady who places up notices trying to find the owner. These attract the attention of tv personality Happy Chapman who is impressed by Odie’s ability to dance. Chapman sees Odie as his ticket to stardom in New York City and pretends to be the owner in order to claim him. After the other animals in the neighbourhood shame Garfield at what he has done, he grudgingly sets forth to rescue Odie back from Chapman’s clutches. Garfield is a live-action film based on the Jim Davis’s syndicated newspaper comic-strip. The comic-strip first appeared in 1978 and has since spread to appear in 2500+ newspapers around the world with an estimated readership of 260 million, which makes it one of the most popular syndicated comic strips of all time and the single most popular currently being produced. Garfield also became a mass-marketing phenomena, spawning numerous lunchboxes, T-shirts, toys (the Garfield sucker-tip toys designed to go on the inside of a car’s rear windscreen became so popular in the 1990s that manufacturers could not keep up with demands), pet food products, reprint books (seven of which were on the New York Times bestseller list at once in 1983), even Garfield-themed holiday cruises and a catalogue for buying licensed Garfield product. Tellingly, by Jim Davis’s own account, he now spends more time dreaming up new ways to market Garfield than he does on the strip, which has been relegated to be drawn by employees. Garfield has previously appeared on film in 12 animated tv specials beginning with Here Comes Garfield (1982) and an animated tv series Garfield and Friends (1988-94). Throughout Garfield was played by veteran voice actor Lorenzo Music. Music would have also voiced Garfield here but died just before the film entered production and was replaced by Bill Murray. Alas, Garfield’s big screen incarnation feels less like an event than simply another film that falls into the big screen fad for conducting talking animal movies in live-action that was created by the success of Babe (1995) and has also included the likes of 101 Dalmatians (1996), MouseHunt (1997), Dr. Dolittle (1998), Stuart Little (1999), Animal Farm (1999), Cats & Dogs (2001), Racing Stripes (2005), Charlotte’s Web (2006), Alvin and the Chipmunks (2007), Underdog (2007), Beverly Hills Chihuahua (2008), G-Force (2009), Furry Vengeance (2010), Yogi Bear (2010), Hop (2011), Zookeeper (2011), Paddington (2014), The Jungle Book (2016), Christopher Robin (2018), Peter Rabbit (2018), Watership Down (2018), Dumbo (2019) and The Lion King (2019). The film is certainly faithful to the details of the comic-strip – all the characters from Jon to Liz, Nermal, Odie and Pookie the teddy bear are up on the screen and there are all the familiar jokes about eating lasagne and watching tv. The comic strip is written with a wry irony as the lazy title cat reflects on the foibles of human behaviour. However, what works as a three-panel strip that builds to a dry punchline does not work particularly well as a dramatic film. Forced to extend the three-panel gags out to a plot, all that Garfield ends up doing is coming across as another of the smartass talking animals that populate much of modern children’s fantasy film. The crucial difference is that the audience for the humour in the Garfield newspaper strip is adults, while the audience for the film is clearly intended as children. Here the character of Garfield has been grafted onto a standard plot that feels distilled from every other talking animal movie – Garfield must venture away from his comfort zone into the big city to conduct a rescue a la Stuart Little 2 (2002); Stephen Tobolowsky is a one-dimensional cartoon villain cut from the mould of Cruella de Ville; there is a good deal of slapstick action with animals causing chaos; there is even a romance between the two human animal owners a la One Hundred and One Dalmatians (1961). The film ends up resembling less a comic observation on pets and their owners than it does a variation on Homeward Bound: The Incredible Journey (1993) where the animals talk. It is all very one-dimensional – the human characters barely even register – Jennifer Love Hewitt has no other purpose in the film than to wear outfits that prominently show off her legs. Such a cutsie one-dimensional plot somehow seems unbefitting for a character like Garfield. In the end, you might compare the film to its title character – a lazy effort that sits there and makes the most minimal attempt to do anything. Mindedly, the comparison falls down in that Garfield has a cynical shrewdness and can outfox all the others around him. In truth, the film bears more of a resemblance to the character of Odie – it has some cute dancing tricks but not a brain in its body. 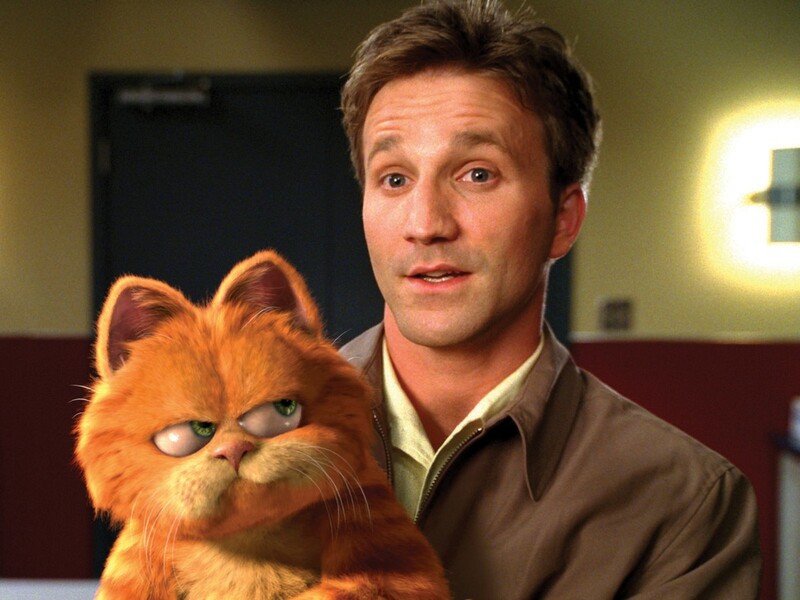 Garfield: A Tale of Two Kitties/Garfield 2 (2006) was a cinematically released sequel, featuring return performances from Breckin Meyer, Jennifer Love Hewitt and Bill Murray. 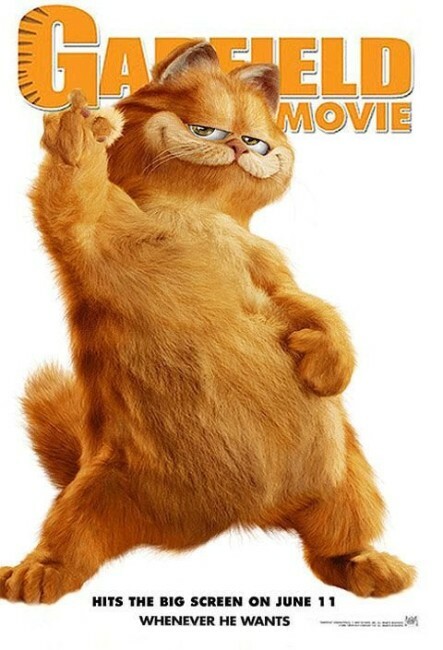 There was a further series of dvd-released animated films with Garfield Gets Real (2007), Garfield’s Fun Fest (2008) and Garfield’s Pet Force (2009). In an amusing touch, Bill Murray gets to make snide comments, stating that Garfield is “the only thing he ever regretted doing” in his dying scenes in Zombieland (2009). Garfield was directed by Peter Hewitt, who has a racked up a number of genre credits elsewhere. Hewitt also directed Bill and Ted’s Bogus Journey (1991); the miniature people film The Borrowers (1997); Whatever Happened to Harold Smith? (1999), a coming of age comedy about a man with psychic powers; Thunderpants (2002), a children’s film about a kid with super-powerful farts; the superhero film Zoom: Academy for Superheroes (2006); and Mostly Ghostly: Have You Met My Ghoulfriend? (2014). Hewitt is also credited with the story for Thunderbirds (2004).